Registration has been extended until April 18th! 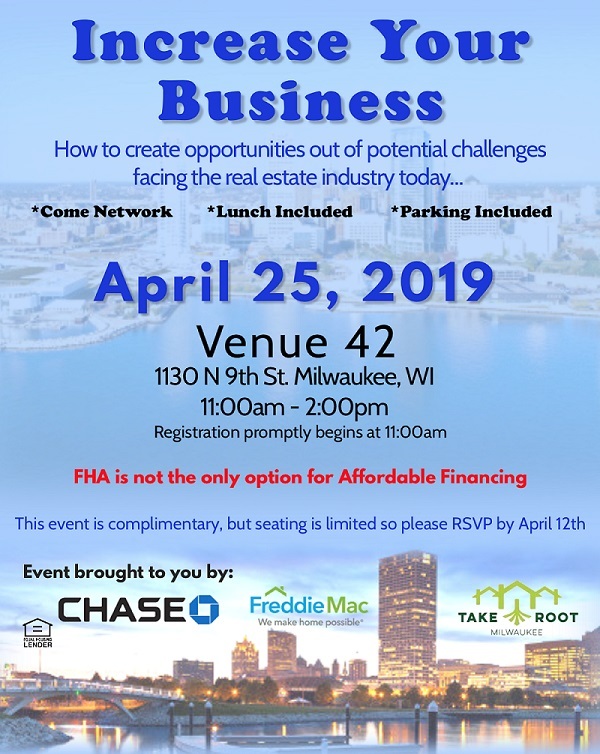 Please join Chase Bank, Freddie Mac and Take Root Milwaukee for a FREE lunch & learn event. Chase will highlight their DreaMaker Product and their $2,500 Chase Homebuyer Grant. Attendees will have the opportunity to meet with Chase’s Milwaukee-area affordable lending team, learn about how you can connect clients to their products, and hear about Take Root Milwaukee – a consortium of lenders, Realtors, housing counseling agencies, and neighborhood and nonprofit groups dedicated to helping individuals and families connect to resources that can assist with buying, fixing and keeping a home. Event is FREE but you must register in advance. Click Here to Register.